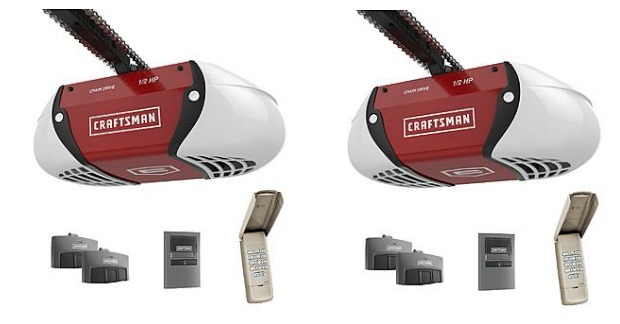 Craftsman ½ HP Chain Drive Garage Door Opener Only $36.25! Down From $200! You are here: Home / Great Deals / Craftsman ½ HP Chain Drive Garage Door Opener Only $36.25! Down From $200! Sears has this Craftsman ½ HP Chain Drive Garage Door Opener for just $143.99 and Shop Your Members can get back $92.74 in points, making it only $36.25! Make sure to clip the $15 off $100 Sears coupon before you checkout! The Craftsman ½ HP 54985 also offers convenient features such as a Tri-Frequency Radio System and Anti-Burglary Coding Technologyproviding convenient and secure operation of your garage door.